I know that I am a little late on reading this book & by a little, I actually mean years late. The leaves in my backyard looked like they were on fire so of course I had to take a photo with them. After reading this book in 1 day (! ), I can see why this topic & book has resonated with millions of people all around the world. The way that Susannah recalls the worst month of her life is beyond chilling and how she can put all of it on paper is astonishing at the same time. Descending into madness. Going crazy. Manic episodes. Bipolar Disorder. Insomnia. Hallucinations. Hearing sounds. Seeing colors dance. Multiple Personality Disorder. Seizures. Those are all symptoms or disorders that Susannah, her family & team of doctors heard or tried to diagnose her with during those months. 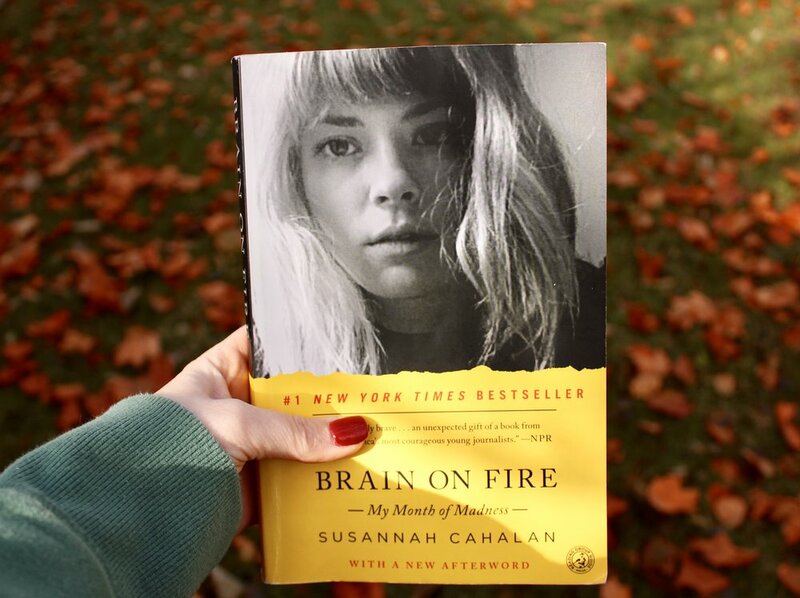 By being diagnosed with a rare auto immune disorder, Susannah finally had answers for why her whole life and personality flipped upside down. Throughout the book, the author describes her various stages of the disorder - hallucinations, acting out of character, extreme narcissims, until she has a seizure that sends to her the hospital. After being admitted, it is a race against time to figure out what is wrong with Susannah while she is going into a catatonic state and could very well die without knowing what is wrong. Right at the very last second, her Doctor figures out what is going on with her brain and has he describes it as being on fire. Her body is attacking her brain and he provides the right treatment of care to correct her symptoms and she starts becoming herself again. The author does a remarkable job at recounting those moments while her disease is taking over & telling the reader the real science behind it. I also think that there is a powerful message behind knowing that this disease exists. That message is that there are people who are wrongfully diagnosed as being “crazy” and just need a different set of medications & they will be “normal” again. I loved this book and could not put it down. I devoured every word and wanted to know more about Susannah and her life beyond that month of madness. As it turns out, her story has a happy ending. She married the man who stood by her and believed that she was still in there when she couldn’t see that or feel that she was still in there. I highly recommend this book to anyone who wants to learn about a new topic and how 1 month could change a life completely. Please let me know if you have read this book & what you thought! Welcome to the Year of Cozy.